Home Event PRIZE PACKAGE #4 WILL HAVE TWO WINNERS!! 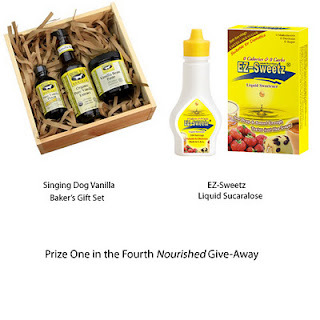 I am so excited to tell you about the 4th Prize Package in the Nourished giveaway. And this time there will be 2 prize packages and 2 lucky winners! One winner will receive a Baker’s Gift Set of vanilla products from Singing Dog Vanilla, with a retail value of $34.99 PLUS a 6-pack of 0.75-ounce bottles of EZ-Sweetz liquid sucralose, with a retail value of $62.99. That’s a grand total of $97. 98! 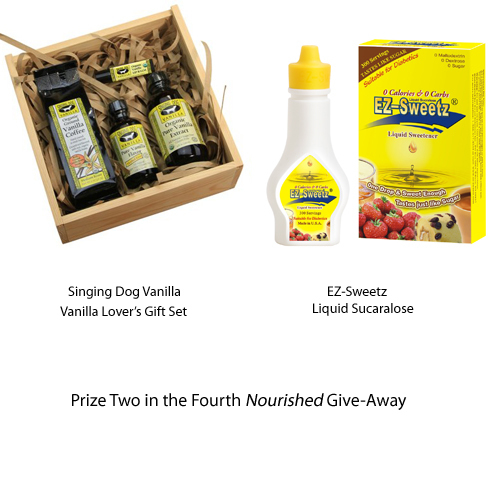 The second winner will receive a Vanilla Lover’s Gift Set from Singing Dog Vanilla, valued at $28.50 PLUS the 6-pack of EZ-Sweetz liquid sucralose, valued at $62.99 for a total of $91.49! The Baker’s Gift Set from Singing Dog Vanilla, is the perfect gift for the person in your life who loves to bake. It includes a bottle of Organic, Pure Vanilla Extract with a whole vanilla bean inside, a jar of Vanilla Bean Paste for adding a touch of class to any dessert, and a bottle of alcohol-free Pure Vanilla Flavor for adding real vanilla taste to frostings and cold desserts. The Vanilla Lover’s Gift set includes Organic Vanilla Coffee, Organic Vanilla Lip Balm, Organic Pure Vanilla Extract, and alcohol-free Pure Vanilla Flavor. One of my favorite new recipes in Nourished, Vanilla Spice Broiled Chicken, was inspired by a recipe for a barbecue rub from the Singing Dog website. Singing Dog, all-natural, fair trade, organic, and sugar-free vanilla is available in natural stores nationwide and online from www.singingdog.com and www.lowcarb.com. The makers of Splenda chose to use sugar as the bulking agent for their sucalose products. What were they thinking? It adds 24 grams of sugar (that’s 6 teaspoons!) to an amount equal to one cup of sugar (sucrose). Finally we can choose to have a zero-calorie, zero-carb sweetener without even a trace of sugar. EZ-Sweetz is poised to go mainstream in the next few weeks and it will soon be as readily available in stores as Splenda is now. They will be featuring special introductory offers and coupons on their website at http://www.ezsweetz.com/ and on their Facebook page at http://www.facebook.com/ezsweetz?sk=app_108742052506030. The EZ-Sweetz company has generously provided several 6-packs of their large bottles of liquid sucralose for my readers. The pictures above only show one bottle, but each of the winners will actually get six! Each 6-pack contains a total of 1,800 servings. How sweet is that? EZ-Sweetz, Singing Dog Vanilla. Bookmark. Now, this giveaway excites me…Vanilla and Sucralose added to plain homemade yogurt is my favorite way to end the day–so soothing and satisfying. I would be a happy winner! I would love to win one of these giveaways. I would like to enter. My email is kenneth.row at gmail.com.